We release our music under a Creative Commons license. Creating music on the cheap requires inexpensive (but effective) tools. Here are some that I've used. Performers need to process audio recordings, and you don't have to look any further than Audacity for that. Audacity allows you to do multi-track recordings, cut and paste, filters, fade-ins, fade-outs, etc. Basically, Audacity is to sound what a word processor is to text. Audacity can export the finished projects to MP3 or OGG Vorbis. Audacity is cross-platform, running on Linux, Windows, BSD, and OS X.
Composers, on the other hand, need to put their music into a readable format... fake sheets, guitar tabs, or sheet music. Now, there is a software package that creates really amazing sheet music on par with that produced by high-quality typeset published music. That's GNU LilyPond. LilyPond does for sheet music what TeX does for text publications... it takes a description of the output and makes it look positively outstanding. Read this essay for a complete description (link). The problem is that it's not the easiest thing to use. Oh, let's face it... it's an esoteric mess. What's needed is an easy-to-use editor produces output LilyPond can read. We'll come back to this thought. In the meantime, let's look at some editors. The "premier" music typesetting package is Finale, but as the cost is $600 for new users and about $115+ for upgrades, I haven't bought it. Frankly, I don't think Finale's output justifies the price if you're creating MIDI files and sheet music. If you compose for a living, you'll probably buy this though. That might change in the near future. I've used number of different programs... including commercial software like Music Write and NoteWorthy Composer. Neither of these is free, but that's not the biggest strike against them. I don't find Music Write ($59.95) very easy to use, although it seemed that way when I first used it (possibly because it was the first program of this sort I used). Among other things, Turtle Beach muddies the waters with too many versions of this program. There's Starter, and Songwriter, and Maestro... the only one worth considering is Maestro. But there are other packages that are better for my purposes and maybe for yours. 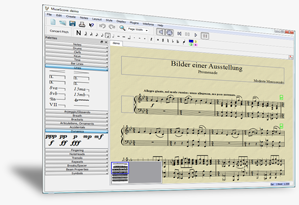 NoteWorthy Composer ($49) is a bit cleaner and easier to use. It's also easier to enter lyrics (although this can be improved upon). I used it to create the sheet music on this site. Now, it works, and like Music Write, it allows you to record from a MIDI keyboard, simplifying note entry; but I'm not terribly thrilled with the limited number of formats that either of these programs read and write. Basically, they don't play very well with others. And that's a big, big negative. For instance, they can't share files with each other, so if you're working with a partner you've got to use the same program. So now you're not working with the music, you're working with the tools. The tools should be invisible. Also, the sheet music produced by both NoteWorthy Composer and Music Write is ... well... mechanical. It just doesn't look very good. It's computery and regimented, and doesn't flow at all like sheet music should. I suppose that people who grew up with this stuff wouldn't notice the difference, but I have inherited a lot of music from the early half of the 20th century, and it's beautiful. You can't say that about these commercial packages. Now, it would be really cool if NoteWorthy Composer or Music Write could write to LilyPond's format for really professional rendering, but they can't. Denemo is an attempt at putting a front-end on LilyPond, and it sort of works. But it's weak compared to the commercial software mentioned above, and I frankly don't like it much. It's too... programmy. Where the commercial software fails on the output, Denemo fails on the input. It's no better in the interoperability department either... it reads MIDI files and its own format. It exports to all of these, plus PDF, PNG graphics, PostScript, SVG, WAV audio, FLAC audio, and OGG Vorbis. It really, really improves on NoteWorthy's method of lyric entry. MuseScore gives you real-time WYSIWYG data entry instead of having to count syllables on a lyric sheet. It lets you input notes from a MIDI keyboard, like the commercial software, and unlike the weaker Open Source programs. It supports multiple instruments and every clef (including TAB) so you can create band scores as they're meant to be seen. LilyPond. I mentioned it above, but it bears highlighting. Once you've composed and arranged your piece you can export it to LilyPond's format and get an absolutely superb rendering of the music. It's cross-platform, running on Linux, Windows, and Mac OS X. Those expensive commercial packages only run on expensive commercial computers. MuseScore is a real keeper. I expect that it will get much better as it moves past the version 1.0 mark. An honorable mention goes to the Able Midi Editor ($24.90), which side-steps the whole notational issue by throwing away classical notation in favor of a "piano roll" editing. This is dead simple to comprehend... at the left of the windows is an illustration piano keyboard. Each not is a mark beside the key it represents. The duration of the note is represented by the horizontal length of the mark. That's really nice if you don't read music and your needs are simple. But it has a lot of downsides. Music is, by its nature, expressive... and this notation is not. Slurs... dynamics... forget 'em. But it's a nice try. WIDISoft also publishes an audio-to-MIDI recognition system ($99), which, if it works, may be very cool. I haven't tried it, though, so will leave discussion of it to a later post. What I haven't addressed thus far is guitar tabulature (tabs). Whereas classical notation has notes on a staff of five ledger lines, guitar tabs have 6 ledger lines, representing strings. On the lines are printed numbers, representing the fret on the string. There are a number of packages for this, but the Open Source package worthy of consideration is TuxGuitar. Like all of my recommendations, it's cross-platform, and this one reads and writes GuitarPro ($59) files. Now, if you're learning guitar, run, don't walk, over to TabGuitarLessons.com and click over to the free downloads. Here you'll find Advanced FretPro, a free metronome, and some very nice books (in PDF format) on reading tabs. What's your take on Rosegarden? I used to use it on my Linux machine before I found Musescore. It's actually fairly good. It incorporates both digital audio recording and notation, with a Cubase-like interface. As I was only looking for a notation program at the time, it was a bit overkill, and lacked one important feature: it would not bracket staves together. So, if you were writing a piano part, multi-voice vocal parts, or others that need more than one staff, the program would not bracket the staves together to indicate that they all belong to one instrument or group, as is the accepted standard notation. Otherwise, it seemed pretty good.